The author of the new play Two Alone/Too Together, being performed at Theatre for the New City, warns audiences that his play is “strange” and pushes the boundaries of reality. He would be right. Peter Welch’s play is unsettling, and the uncertainties around his characters, their backstories, and their motivations challenge the notion that a play must be set in a plausible “reality” at all. This artistic choice is not per se a bad one – I have seen numerous plays that take great liberties with the audience’s notion of reality. However, there should also be a discernible reason for manipulating reality – a theme or concept that can be better conveyed in the altered state, for example – and that is where Welch’s play disappoints. Two Alone/Too Together is the story of a concussed patient, Jude Donnelly, who may have recently tried to kill himself and, ostensibly, the nurse, Stephen Essay, who is assigned to stay with him for the evening. As Stephen goes through his normal medical routines, Mr. Donnelly suggests that he and Stephen share a common reality – a mediocre life overshadowed by heartbreak. Specifically, Mr. Donnelly suggests that they have each recently had their heart broken by a significant other. While Stephen repeatedly shoots down any truth in Mr. Donnelly’s supposition, Mr. Donnelly continues to push Stephen to admit his heartache and proposes that the pair engage in role-play to overcome their lovelorn pasts. Despite Stephen’s refusal to pretend to be the person that hurt Mr. Donnelly, the suggestion of role-play is the catalyst that upsets the audience’s (and Mr. Donnelly’s) perception of reality. I will say no more on that point in an effort to preserve the surprise, but, needless to say, Stephen may not be the mild-mannered, uncomplicated individual that he first appears to be (who is, really?). 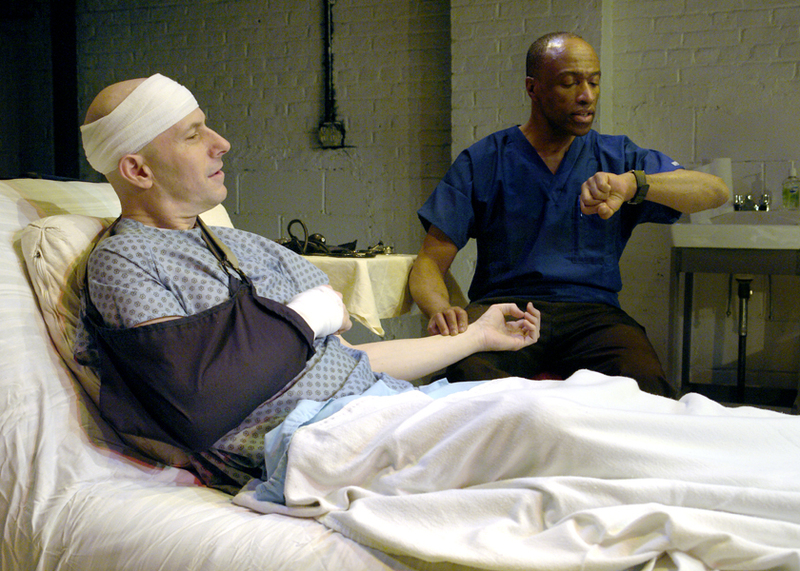 After Mr. Donnelly and Stephen verbally spar and develop an unwieldy and uncomfortable relationship with one another, the play comes to a touching climax as the two characters finally undertake the proposed role-play – Stephen gets the opportunity to engage the man, whom he loved from a distance and regretted never speaking to, in conversation, and Mr. Donnelly gets to play the admired and desirable love interest. In other words, they both have the opportunity to live their ideal reality. Welch’s play explores numerous themes such as the struggle to build oneself back up after disastrous life events, the importance of developing healthy human relationships (and the issues associated with unhealthy relationships), and the exploration of sexuality and intimacy. Therein lies the first great problem with Welch’s play. There is simply too much going on. Do not get me wrong – there are solid story-telling moments that I found engrossing (Stephen’s role-playing encounter with Mr. Donnelly, for example), but other interactions and themes were underdeveloped, and, therefore, added little value to the piece. The second great problem with Welch’s play is the character of Stephen. Stephen is a veritable Jekyll and Hyde whose bizarre behavior could be (a) a product of Mr. Donnelly’s concussed brain, (b) the result of role-playing on Stephen’s part from the get-go, (c) the manifestation of deranged tendencies and deep-seeded emotional problems, or (d) simply an unsettling part of this “strange” play that is not bound by reality. The thing is, the reason for Stephen’s behavior does not really matter. While dark, dangerous, frightening, or challenging situations (emotionally or physically) can certainly lead to personal revelations, there is unfortunately, little emotional or self-discovery (on the part of either character) that arises from Mr. Donnelly’s interactions with Stephen’s darker personalities. So, why undertake the Jekyll and Hyde routine at all? Upon leaving the theatre, I could not help but wonder what would have transpired on stage had Stephen remained a relatively calm nurse with a few issues derived from a history of unrequited love and a difficult childhood. I think that I would like to see that play, actually. Dan Kelley handled both the sinister and the more unassuming aspects of Stephen well, but it was his intense gaze into the audience as he flirted with his make believe crush during the role-play that sold me on his performance as Stephen. Kelley plays the “normal” Stephen so well that his turn as the more sinister Stephen was quite unexpected. The playwright, Peter Welch, also portrays Mr. Donnelly. Welch’s Donnelly comes across as a likable but unimpressive guy who is down on his luck. He is lonely and insecure, and he seems to have been drifting along without much direction for a while. As a duo, Welch and Kelley have an uneasy chemistry on stage, which is fitting for the tone of the show. Ultimately, I wonder if Welch would not have been better served to ground his play a bit more in reality. In between intense physical attacks, emotional breakdowns, and strange plot twists, there were some poignant moments between Stephen and Mr. Donnelly that merited attention and thought. Unfortunately, those moments were fleeting and interspersed with head-scratching interactions that left me perplexed. Two Alone/Too Together is playing at Theatre for the New City until December 22.